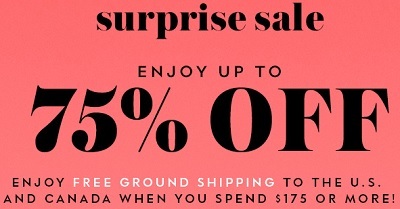 Kate Spade Canada has a special sale offer! Surprise sale is on. Shop the secret sale and enjoy savings up to 75% off retail prices. You can enjoy a huge selection of items included in the sale. It is also possible to enjoy a free shipping on orders of $175 or more! Offer is valid online only, through 09/24/2015. Official source of the information is Kate Spade Canada. More details about the promotion available on the official website.